Turkington Windows were recently pleased to have been involved in the build of an attractive new-build house on the equally beautiful coastline of Northern Ireland. Despite the age-old setting, the combination of smart collaboration an acute eye for detail meant that the result was nothing short of breath taking, providing the homeowners with a comfortable property to enjoy for decades to come. The house proper was constructed by Francey Homes, a home construction company based in County Antrim which built the structure entirely to the architect’s design. It was finished to an exceptionally high standard with a smooth render and painted finish with natural slate tiles, and Turkington Windows were approached to continue this high level of quality with regards to the property’s apertures. We’re no stranger to working with others, having done so many times for both traditional residential homes and large-scale commercial projects. Being an award-winning contractor, collaborating with the folks at Francey Homes as well as the customer’s architect was seamless, and the final result reflects this sentiment. 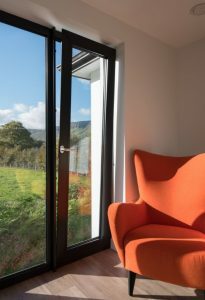 We supplied and fitted a full suite of aluminium products that included both tilt & turn windows & lift & slide doors to better let the homeowners enjoy a greater sense of the outside even when relaxing in. 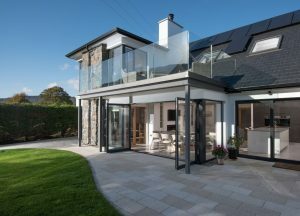 The inherent strength of the aluminium enabled large panes of glass to be fitted and appropriately held, ensuring the customers can enjoy the widest views possible of the beautiful vistas of the Northern Irish coastline. Not only will these high quality products allow for glorious views outside, but they’ll also work wonders in terms of letting any natural sunlight to enter the newly built home. Both windows and doors are effortless to operate, with the lift & slide panels in particular making access natural and seamless every time. We knew that it was vital for the windows in this home to be of the highest quality because of the large areas of exposed glazing incorporated into the design. They needed to perform efficiently as they would regularly be needed to withstand the extremes of weather enjoyed by those living in a gorgeous, but an exposed coastal area where the winds could sometimes be harsh. Needless to say all products installed by the Turkington team were practical as well as stylish. We think you’ll agree that the result is an impressive one, representing the culmination of a joint effort between companies that is just as efficient as it is beautiful. Most importantly, it was a new-build structure that the homeowners were pleased with, being a living space that they could comfortably seeing themselves enjoying 365 days a year. As with every Irish home we’ve had the pleasure of working on, the hard work shines through in the finished product. 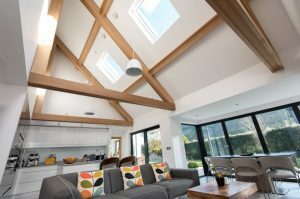 For more information on how our selection of high performance and stylish home improvements can help to increase your style of living, call our team on 028 3833 2807 or contact us online.